Got take out from the new Im Thai (still signed as CK Thai) in the shopping center at Brodie and 290, where Kohl's & Petsmart are located. It's owned by the people who used to own Thai Tara on 6th Street, which was regarded by one of my Thai co-workers as one of the best Thai spots in town. She also didn't particularly care for CK Thai, and I haven't yet asked her about Im. So after running errands one day last week, I was hungry for lunch & got carry out. After pondering the noodle dishes, I picked the Kua Gai, listed right under Pad Thai, and described identically to it, except for using flat rice noodles; I chose pork as my meat. The dish came fast, and 10 minutes later, I was home. It was okay, but not outstanding. The noodles were all very choppy -- none were longer than three inches in length, no nice long strands. The pork was a little tough, and while some of the chile paste added some flavor, there wasn't a whole lot going on; no real sweet & sour flavors to it. It was certainly made fresh, and the lettuce/carrots were a nice touch. The jury is still out though. 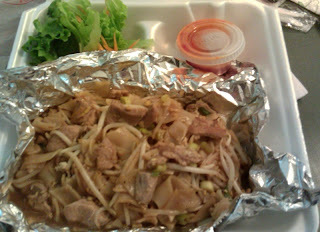 I'll talk with my Thai friend, and see what dishes she recommends, and I'll go back and dine at the restaurant. 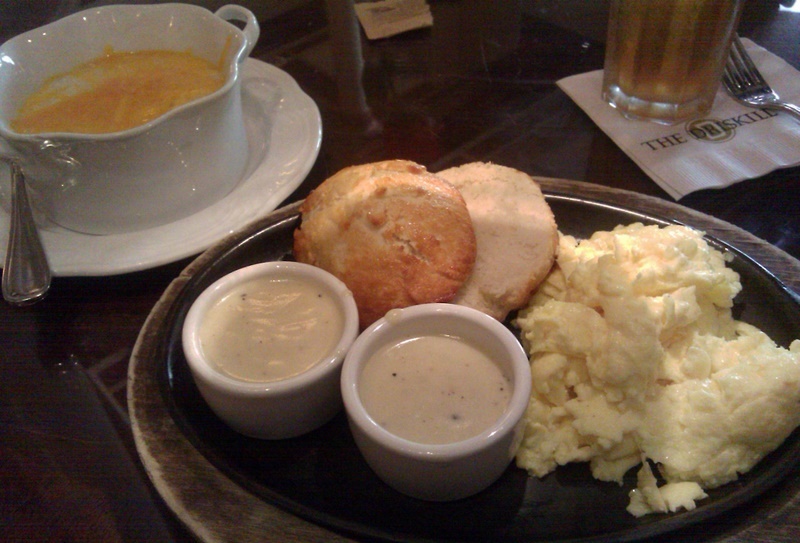 On Saturday, I had brunch at the 1886 Cafe at the Driskill Hotel. I've had a couple really good brunches there before, but this, really unfortunately, missed the mark all around. I am not quite ballsy enough to send my comments directly to the hotel management, but I am hoping someone there is checking up on what people are saying about their facilities. So here's my brutally honest reporting. My friend and I were seated out in the lobby; we both ordered the same skillet, the "D" Texas Two Step, with eggs, biscuit, sausage gravy and cheddar cheese grits; I asked for my gravy on the side. The eggs had no flavor. The biscuit dough was overworked, making a dense, tough biscuit. There was very little sausage in the gravy (that's gravy in both those ramekins). And the grits were awful; I think they used water, not milk in making them (think instant cream of wheat texture), and to me, "cheddar cheese grits" implies there's cheese mixed into it, not just on top. What we were served just had cheddar on top. When our waitress, Callie, came by to check on us, I told her the grits were extremely bland. She immediately apologized, and quickly offered to bring something to replace both of our grits. We both decided on the fruit cup, which had pineapple & fresh mixed berries. However, they didn't take the eyes out of the pineapple, and not just one piece, but all of my pineapple still had the eyes in it. Sometimes you can't win! The one saving grace was our waitress, and while she looked young, she handled everything extremely smoothly and without missing a beat. I can only hope she told the kitchen that the grits were being refused, but who knows. Saturday night dinner was another story. I had the pleasure of 1) dining at Asti, and 2) dining with friends I hadn't seen in a very long time. I have written about Asti before, but it continues to be an interesting and inspiring menu, with great service to boot. I had the homemade pappardelle noodles with lamb sugo; it was fantastic. While you can see the lovely wide noodles under all the ricotta salata in the picture, the generous sprinkling of fresh mint leaves was perfect with the little pieces of pulled lamb. 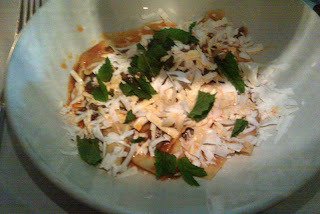 Friends had the linguine with white clam sauce and the scallops with pancetta, all of which was exemplary. We split the affugato dessert (shot of espresso poured over vanilla gelato, and cinnamon sugar donut/beignets to dip in it), which was the perfect finish. The place was packed, and while we were sitting in the back of the restaurant, it was a little warm in there. Dishes came fast; we started with the mixed appetizer plate, which arrived just moments after we ordered it. I asked our waitress if the "Next Food Network Star" contestant, sous chef Brad, was still working there, and yes! She pointed him out along the open air kitchen. He's tall, that's about all I could tell. Anyway, happy to know that Asti is alive and well! 1886/Driskill....anyone paying attention, or do you just think you're feeding out of towners?